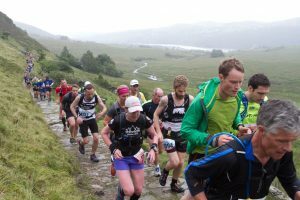 SCOTT Snowdonia Trail Marathon – 2017 Date Confirmed and Registration to Open | News by Wales Express News, People Before Profit! The award winning SCOTT Snowdonia Trail Marathon 2017 will take place on Sunday, July 23, next year, with entries opening noon on Friday, October 14, 2016. The hugely popular 2016 edition of the trail marathon sold out in record time with over 1,200 people running the incredibly demanding marathon, half marathon and 10 km routes. Due to huge demand and interest, even more spaces will be made available for the 2017 race. The SCOTT Snowdonia Trail Marathon is THE marathon challenge for 2017 – the route explores the stunning trails, spectacular panoramic views, and tough climbs that make Snowdonia National Park such a mecca for outdoor enthusiasts. Visiting Rhyd Ddu, Beddgelert, Nant Gwynant, Pen y Pass, ascending Snowdon before a steep descent back to the event village in Llanberis, this is a bucket list event in every sense of the word. For more information on this one of a kind challenge and to pre-register, visit snowdoniatrailmarathon.com.